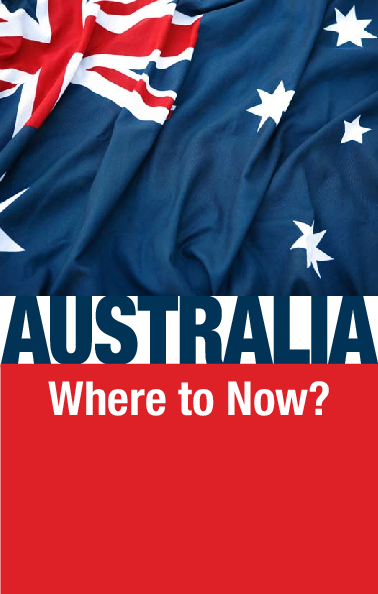 From the booklet Australia—Where to Now? “Five teenage boys from a Pacific Islander background face 101 charges after they allegedly attacked staff, students and property at Merrylands High School with baseball bats, samurai swords and machetes. Sydney newspapers suggest the attack was just the tip of the iceberg of a growing gang problem in western Sydney, driven by a romantic inspiration from Los Angeles’ organized gang culture and fueled by the Internet” (abc News, April 9, 2008). This was not the first such instance of gang violence perpetrated in Sydney’s western district by a subculture of young hoodlums who choose to place themselves on the fringe of society, their young minds deeply seared by an uncivilized mentality of sheer savagery. “The rampage at Merrylands High School is the latest in a series of attacks in western Sydney by a gang of mostly Islander teenagers, who brazenly display guns, knives and cash on their social networking websites. Some of the five teenagers accused of the school attack gestured obscenely yesterday on their way to court to face more than 100 charges of assault and affray. … The rampage has opened a window on a world of violence, drugs and guns grown out of a veneration of American criminal culture” (Sydney Morning Herald, April 9, 2008). In some of these youths, the savagery is so deeply embedded that incarceration in the company of hardened criminals is preferred by them to the freedom of the streets. Over the past 40 years, we have grown used to seeing the progressive defanging of the law under the creeping influence of social engineers intent on severing all connection between civilized society and the Anglo-Saxon traditions that have fostered the most stable of societies for centuries. So it came as a bit of a shock to read of a government official actually recommending the creation of a new law to permit the specific penalizing of such criminal acts as these young savages were guilty of staging at Merrylands High. “The [New South Wales] premier, Morris Iemma, told Parliament yesterday that he had asked the attorney general, John Hatzistergos, to investigate whether a new offence needed to be created in the wake of the Merrylands rampage to cover incidents in schools” (ibid.). How things change in a couple of generations. Back in the 1940s and ’50s, such a scene as burst upon the morning assembly at Merrylands High School April 7, 2008, would have been unthinkable. Not until the American movies Blackboard Jungle and James Dean’s Rebel Without a Cause hit the silver screen in Australia in the mid-1950s did we dream of such a thing as school campus violence even being a possibility. Even then it took years for the type of teenage rebellion characterized by such media to begin infiltrating into the city schools of Australia. And that was only after we started to fiddle with the basic judicial underpinnings of our society. Once the concept of emphasizing the importance of “self-esteem” became more important than that of exercising individual personal responsibility for one’s actions, the liberal socialists began to have a heyday with the law, watering it down in so many instances to the point that the criminal was often paid more deference in the courtroom than his victim. So it is a little heartening to see a government official touting for more teeth in Australia’s increasingly emasculated law. There are simple causes for what happened at Merrylands in April 2008. It’s not as if we couldn’t see it coming. Take the defense of those virtues out of the law, and societal catastrophe will soon follow. Given this trend, we should hardly be surprised by the findings of Australia’s inquiry in 2008 into the reasons for the rise in dysfunctional families within the country. According to abc News: “A new report is calling for a $1 billion funding increase to tackle what it says is the worsening problem of youth homelessness. The inquiry by the National Youth Commission has found the number of young homeless people in Australia has doubled in the last two decades. It says about 36,000 Australians under the age of 25 do not have stable accommodation …. “It says the money needs to go towards more accommodation and early intervention programs to stop the causes of homelessness, like family breakdown. “Anglicare Australia executive director Kasy Chambers is endorsing the report’s findings, saying it shows the complexity of the problem of youth homelessness. ‘It’s not just about not having a roof over your head, there are mental health issues, there are substance abuse issues, there are issues from the young people’s family or origin, and time and time again we see this greater complexity,’ she said. “She says governments now need to follow through on the evidence in the report. ‘We’re seeing … increasing complexity, and we’re seeing people who are becoming very marginalized from the rest of society,’ she said” (April 8, 2008). Yes. Take away the simplicity of good basic common sense, start to fiddle with the fundamentals of good old British common law, and you end up with the complexity of rank confusion. Just how far Australia has drifted from its cultural moorings is further revealed in another report. The Sydney Morning Herald wrote March 13, 2008: “In a wide-ranging new geo-demographic survey of the country, researchers have found that unmarried women now outnumber married women for the first time since World War I.
Australia is reaping the results of the onslaught of its mid-20th-century social reformers. Compounding this devastating picture of a society cut adrift from its traditional moorings, the power of the multiculturalists to add further confusion to an already volatile societal powder keg is revealed in Mosaic 2008’s revelation that “50 percent of all Australians have one parent born overseas, of whom only 14 percent were born in the UK; Africa, India, Indonesia, Singapore and China are the fastest-growing sources of immigrants” (ibid.). The strength of Australia as a nation was once rooted in the virtues referred to by Winston Churchill as “the greatest virtues, the most dominating virtues of human society.” Those virtues are not of African, Indian, Indonesian, Singaporean or Chinese origin. The virtues that Churchill referred to are those same virtues that learned historian Gertrude Himmelfarb sees as having given remarkable stability to the Anglo-Saxons during the time of the greatest reach of the British Commonwealth and Empire. Contrasting the strength of the moral society that underpinned the power of imperial Britain with the subculture that inhabits many a city street in America, Britain, Canada, Australia and New Zealand today, Himmelfarb declares, “Where Victorians had the satisfaction of witnessing a significant improvement in their condition, we are confronting a considerable deterioration in ours” (The De-Moralization of Society). Now that’s a reality that too few in today’s government within Australia would acknowledge! Himmelfarb points to the innate tendency of the human mind to blind itself to reality, noting, “For a long time social critics and policy-makers have found it hard to face up to the realities of our moral condition, in spite of the statistical evidence” (ibid.). So how many more surveys do we have to engage in to lift the blind off the fact that violent images in print or in video format beget violent behavior such as that glorified by the Merrylands teenage thugs? How much research do we yet have to undertake to prove the reality that perverse behavior begets increasingly more perverse behavior? How many more reviews of the traditional nuclear family do we have to conduct to reach the conclusion that single-parent families produce unbalanced children? The findings of Australia’s National Youth Commission and of Mosaic 2008 were all entirely predictable 30 years ago. There’s only one way that Australia’s increasing social catastrophe will be solved. And it starts and ends with good, solid family government!